In summer, people from everywhere flock to the Canadian Rockies to hike, bike and paddle on glacier-fed waterways. In winter and spring, snow is king. Champagne powder, steep mountain faces and the backcountry beckon to adventurers from around the planet. However, autumn in the Rockies—when nature’s colours are vibrant and wildlife is on the move—is a world of its own. Roads are free of traffic and trails are quiet. Waters are calm and peaceful. And you get to bask in that rare I-am-but-a-speck-in-the-wilderness feeling. 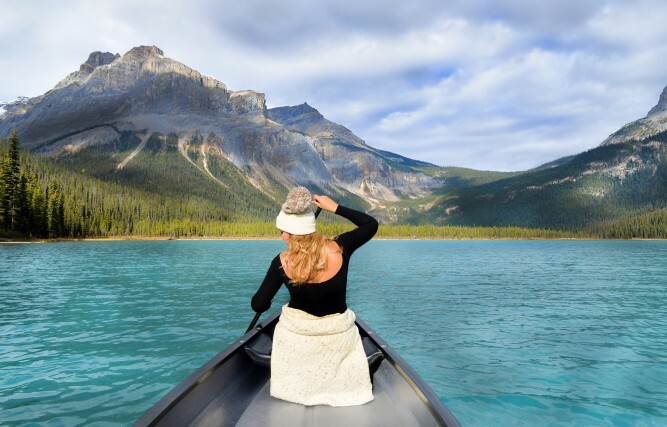 Earlier this month, I left Calgary behind and paid a visit to Banff and Yoho National Parks during this beyond beautiful season. I bunked in at three iconic mountain lodges which made for a gorgeous getaway centred around wilderness adventure, relaxation and delicious dining. I hope you enjoy the following snapshots from my “Fall in Love with the Rockies” album. 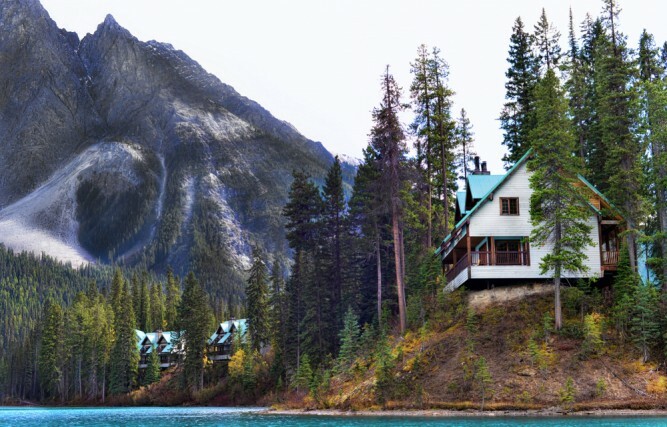 The trailhead for Star Wars/Return of the Jedi is located right behind Buffalo Mountain Lodge in Banff, Alberta. This adrenaline-packed mountain bike trail is full of all sorts of twists, turns and obstacles. Now, I consider myself a decent biker—having pedalled my way through the Rockies and Utah, gloves on, helmet secured and rocking the scars to prove my, ahem, prowess. But this supposed beginner to intermediate level loop beat me down! Good thing the welcoming Buffalo Mountain Lodge is standing close by. The rooms are rustic, thoughtfully decorated and equipped with wood-burning fireplaces to keep you warm on cool mountain nights. When I stay at a hotel, I typically use it as a crash pad. But in this case, my accommodations, complete with a charming claw-foot tub and heated bathroom floor, seduce me to linger. Canadian Rocky Mountain Resorts, which owns Buffalo Mountain Lodge, is famous for its regionally-inspired cuisine. (The Calgary-based company has even published a cookbook, Simple Treasures, that Toque & Canoe had a hand in.) 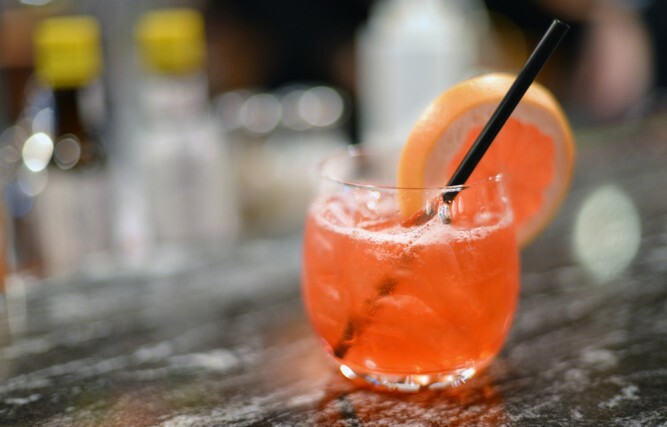 The locally grown ingredients and the house-made preserves served here are hard to beat, and the drinks are as pretty as they are delicious. This Grapefruit Tunnel Mountain (with Bombay Gin and Campari) is no exception. 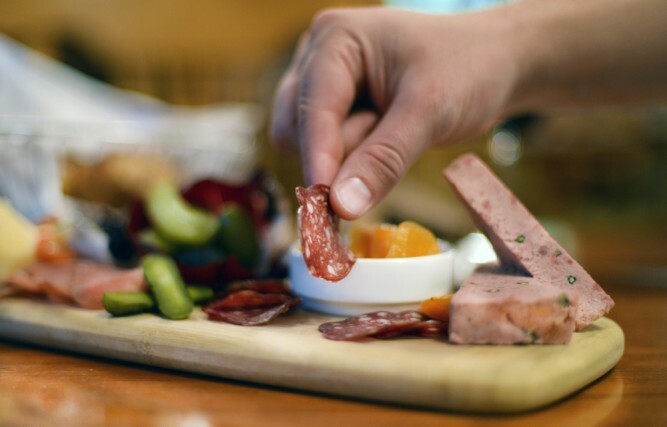 The charcuterie board from the lodge’s Sleeping Buffalo Dining Room is chock-full of meaty goodness, featuring wild-boar pate, elk salami, smoked duck breast and air-dried buffalo. Sylvan Star gouda, mustard melons, olives and pickles round out the platter. As my husband and I head from Banff towards Emerald Lake Lodge which is located near Field, B.C. 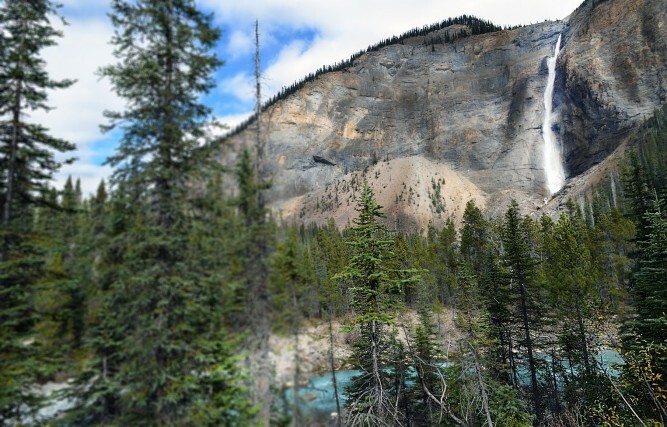 (open through the fall for the first time in three years), we detour to Takakkaw Falls in Yoho National Park. Lucky for us, Buffalo Mountain Lodge sent us on our way with a toothsome packed lunch. So when we arrive, we get to picnic on fresh sandwiches and home-made granola. Bonus? We do this in the comfort of Parks Canada’s signature red adirondack chairs which are perched in front of the falls (and are found at scenic locations in national parks from coast to coast.) We also make a point of visiting the impressive Natural Bridge—a rock formation that spans the Kicking Horse River just west of Field. Totally worth checking out. The landscape around Takakkaw falls is as spectacular as the falls themselves. I especially love the area’s mineral- and sediment-rich creeks. 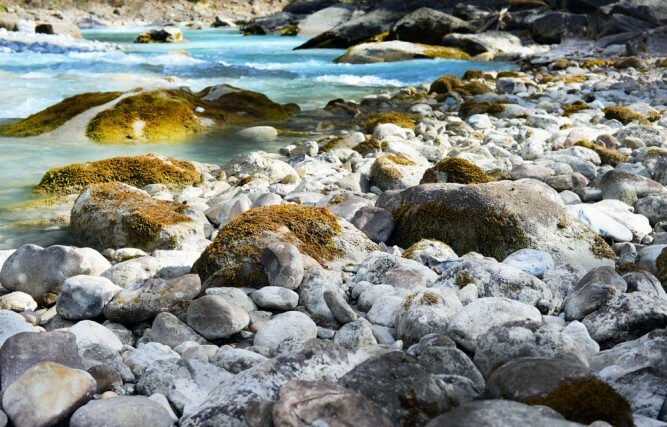 These milky blue, glacier-fed waters feature the softest hues of turquoise, and are made even more striking by the grey river stones and richly coloured moss beds that frame them. 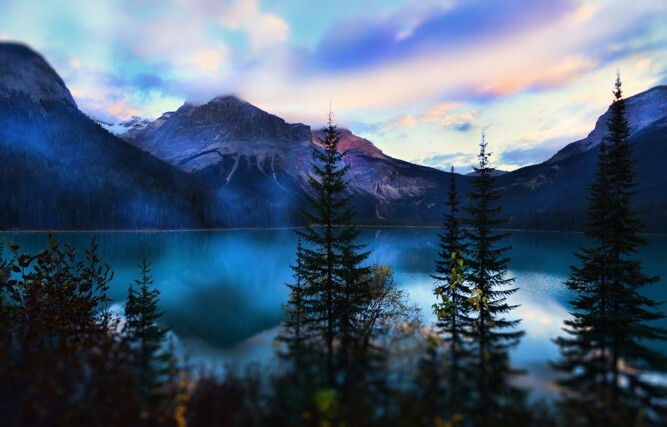 Emerald Lake Lodge’s homey cabins boast views that alone make a visit to these parts worthwhile. We’re lucky enough to stay in a cabin along the lakeshore. You can bet we especially enjoy watching the sunset and sunrise and their kaleidoscope of colours from our balcony. If the late-day light is gorgeous in this part of the world, early-morning light in Yoho National Park is its extra-gorgeous big sister. 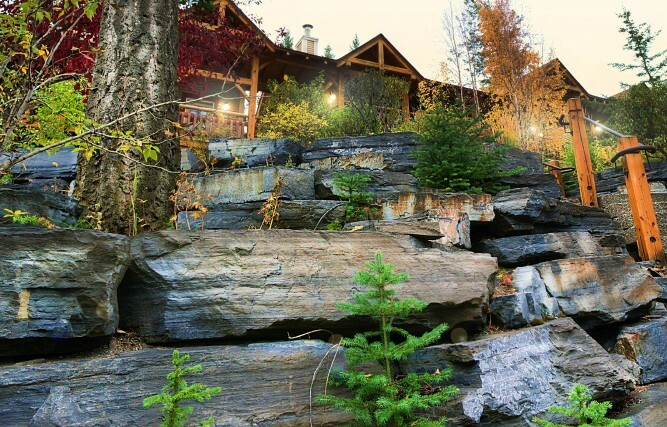 Get the most out of your mornings at Emerald Lake Lodge by waking up after sunrise and heading to an outdoor fire pit located along the lakefront. Build a big, crackling fire and then watch as saturated blues, purples, and pinks envelop the landscape. Lodge staff are well aware of these extraordinary mornings. The firewood is stacked and steaming to-go cups of coffee await ambitious early risers. After leaving Emerald Lake, we head east to the historic Deer Lodge, a stone’s throw from Lake Louise in Banff National Park. The lodge’s Caribou Lounge is a classic, sun-soaked room with impressive views of the Victoria Glacier. 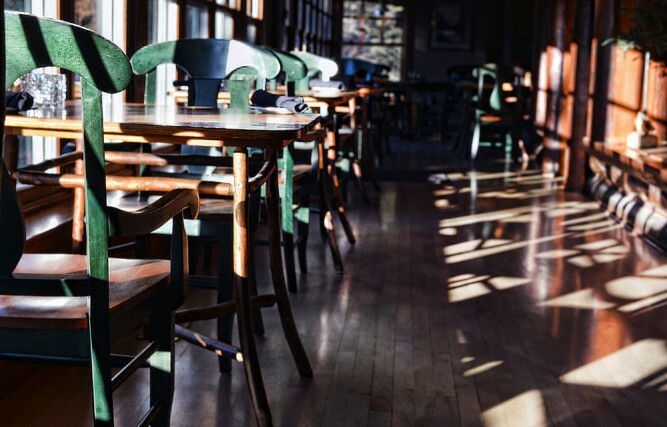 The lounge is attached to the lodge’s Mount Fairview Dining Room and offers a warm, casual atmosphere with both lounge and dining room menus. 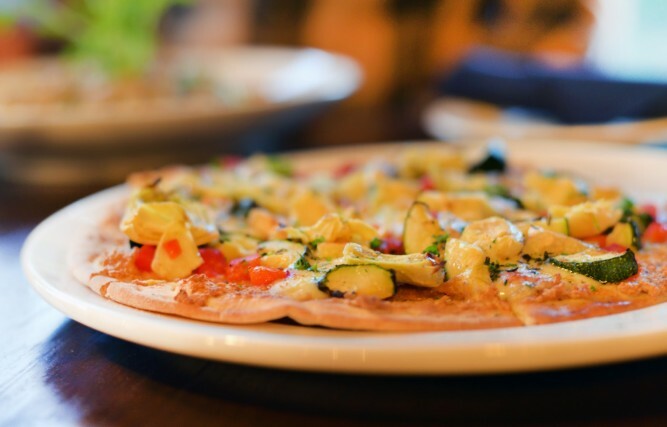 For dinner, we choose a roasted-vegetable flatbread with garlic (and they mean garlic!) crust. I can taste the quality in the ingredients—the artichokes, zucchini, peppers and brie. Delicious. 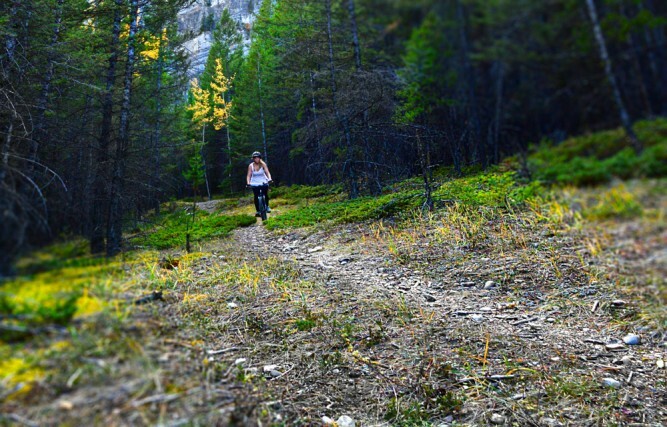 Not far from Deer Lodge, you’ll find a well-marked trailhead to Lake Agnes. The hour and a bit hike up to Agnes is a beauty. We keep trekking to the west end of the lake where we end up in a boulder-strewn meadow covered in moss and lichen and dotted with chatty marmots. These guys actually holler. You’ll know them when you hear them! 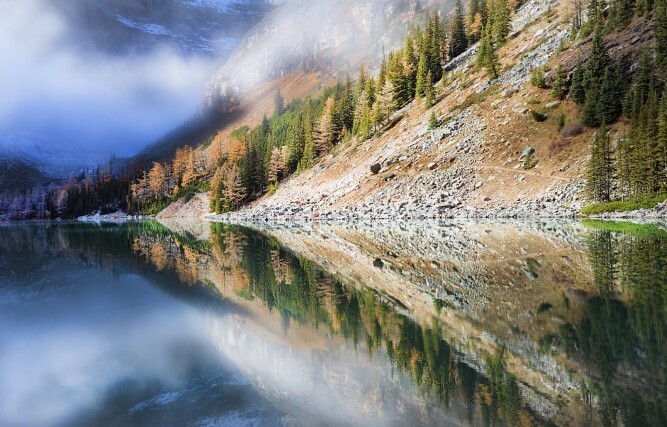 In the autumn, Lake Agnes—found high above the more famous Lake Louise, seems more tranquil than usual. Agnes sure gives her big sister a run for her money. 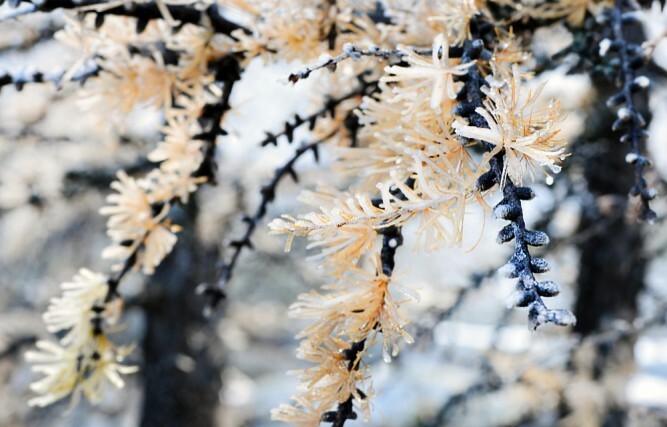 In autumn, plants are still full of life, with snow and ice threatening to smother them. Wild animals are wide awake and roaming the forests, but beginning to store food and prepare for the frigid months to come. Lake Agnes is the perfect place for experiencing, really seeing and feeling, this in-between season. Deer Lodge is a step back in time, with antique décor, warm-hearted staff and something in its atmosphere (I’m not sure what exactly) that makes you feel like you’ve arrived home. 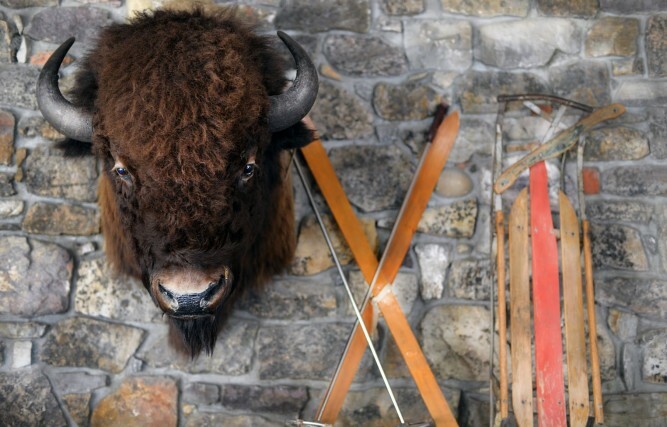 I put on my slippers, grab a book and a glass of wine and plunk down by the fire, under the close supervision of the handsome bison pictured above. 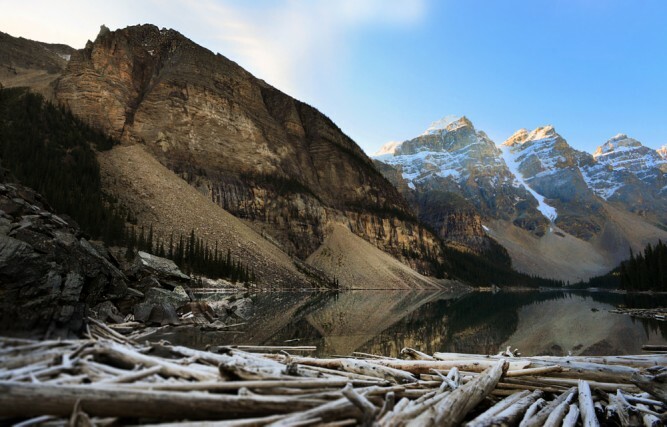 Before we grudgingly wrap up our weekend getaway, we detour to Moraine Lake, about a 20-minute drive from Lake Louise’s Deer Lodge. The lake this time of year—like so many of the wild places I’ve just visited—is all kinds of stunning. 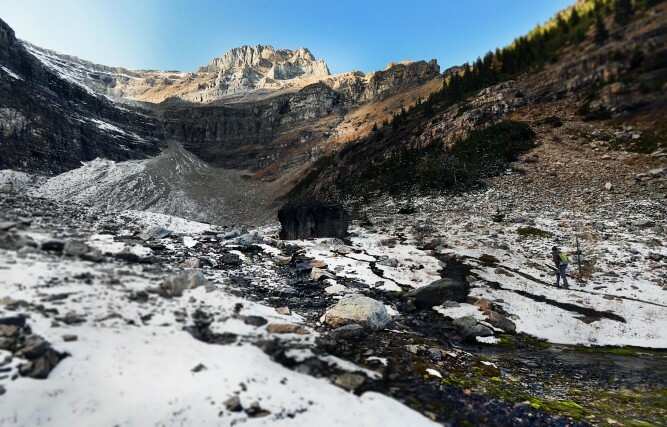 *Editor’s note: Thanks to Stephanie Arsenault (above) from GlobalDish.ca for taking us on this tour of the Canadian Rockies. For more stories (and delicious photos) by Stephanie, check out her other Toque & Canoe posts The Magdalen Islands and The Maggies – Part Two. A warm thanks to Canadian Rocky Mountain Resorts for hosting Stephanie. *This post was not reviewed or edited by our partners in tourism before publication. So beautiful 🙂 Makes me miss Canada very much indeed. Thanks for commenting Krista. When was the last time you were here? And where did you go? Stunning photos. What a lovely collection that celebrates The Rockies. Oh Canada! I only wish the lady in the canoe had been wearing a PFD/life jacket. That lake water is extremely cold and one does not last long if an upset occurs and one cannot get back into the canoe, even in the summer. Looking forward to more of your photography in the future. Amazing combination of forest, mountains and lake..